Is there a better marriage than the one between mac and cheese? 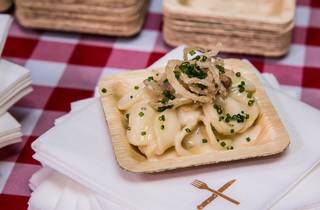 To celebrate this most holy matrimony, we’re bringing back our popular Mac and Cheese Smackdown for the second year in a row, filling up Downtown’s Bank of America Plaza (333 S Hope St., #100) with L.A.’s best mac and cheese dishes. Join us on Sunday, December 4 as we challenge restaurants to offer creative takes on this cheesy classic in the ultimate showdown to crown L.A.’s top mac. When purchasing tickets, choose from 12:00 - 2:00 pm, 2:30 - 4:30 pm, and 5:00 - 7:00 pm. 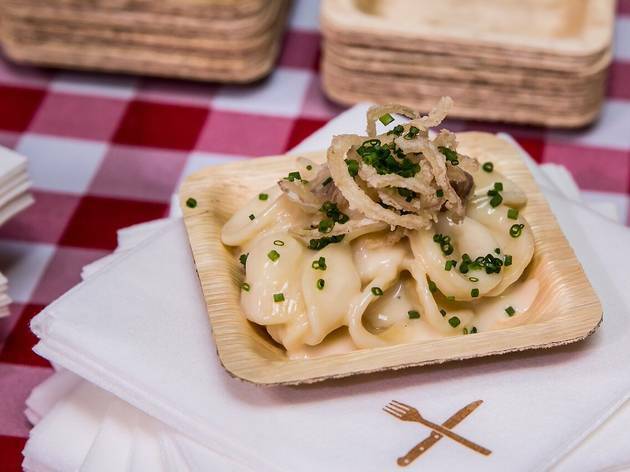 Your ticket includes mac & cheese tastings from each featured restaurant paired with complimentary Dark Horse Wine, Angel City Brewery Beer and Rekorderlig Cider. Crème Caramel LA is providing dessert, too: a mini pavlova with candy cane meringue and chocolate and vanilla custard. Oh, and Best Friends Animal Society will be there to talk all things adoption. Mac and cheese, beer, music—best Sunday ever?